Numan is a professional Digital & Marketing Agency html Theme with sass compiled. 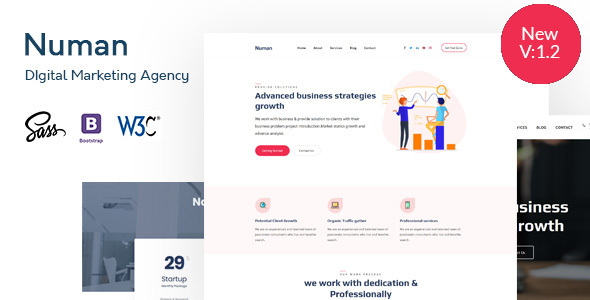 This theme is perfect for Business, SEO,Digital marketing, Content Marketing, Consulting and Financial Companies, Digital Agencies, Analytical Groups and Large Corporations etc..
Added slider version with different design and extra pages. Responsive Layout Design:Bootstrap 4 is built using the perfect grid system. Our customized template for mobile offers a seamless user experience. Validated HTML CSS Files: This template is 100% compatible with w3c standard. Easy to Customize: This template is easy to customize as you want. Vry clean and well commnted code.